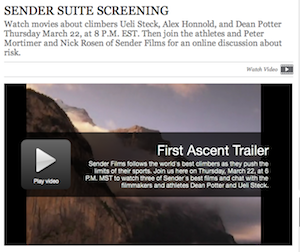 Outside Online is doing something cool on their site tonight as they’re screening three short movies from Sender Films: Swiss Machine featuring Ueli Steck, Fly or Die featuring Dean Potter and Alone on the Wall featuring Alex Honnold. If you hadn’t already seen these movies this would be a great opportunity to catch them for free. Showtime is at 6 PM MST. In addition the screening, Ueli Steck, Dean Potter and the crew from Sender Films will be on hand starting at 7 PM MST for a live chat to discuss “the nature of risk in climbing”. Even if you’ve already seen the movies that part could very well be worth tuning in for.